A launchpad for young opera singers. Heats are held for eligible entrants around Australia, in New Zealand, and in London. Contestants will sing 2 items from their repertoire. The first will be their choice, and the subsequent piece(s) will be selected by the Adjudicators. After singing, each contestant will be interviewed by the panel. The National Adjudicator and a specially convened Adjudication Panel will select 10 Semi Finalists to proceed to the next stage. The Semi-Finals will take place in Sydney. A new panel of Adjudicators will join the National Adjudicator. Five Finalists will be selected from the Semi Finals to proceed to the next round. Finalists will need to make their way to Sydney for the Finals at their own expense and must ensure that they are able to attend all days of activity and adjudication. 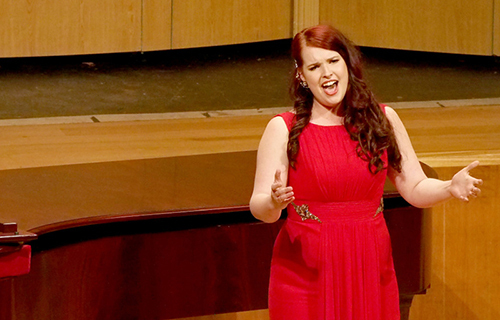 Five Finalists perform 2 items each accompanied by the Opera Australia Orchestra. The Adjudication Panel will announce scholarships, awards and prizes at the conclusion of the concert. The recipient of the Marianne Mathy Scholarship, "The Mathy", will be named as the overall winner of the ASC. Applicants must fit certain criteria to be eligible for the Australian Singing Competition. An entrant of the IFAC Handa Australian Singing Competition (“the Competition”) must be – (i) under 26 years on 23 June 2019 (must be born after 23 June 1993); (ii) a Citizen or Resident of Australia or New Zealand; or any holder of a valid Visa to Australia; (iii) an amateur or professional classical singer. It is recommended that the entrant be over 19 years of age. A previous winner of The Marianne Mathy Scholarship is ineligible to enter. Entrants must ensure that they are available to attend all the events listed for the Competition. (iii) an amateur or professional classical singer. It is recommended that the entrant be over 19 years of age. 1.2 A previous winner of The Marianne Mathy Scholarship is ineligible to enter. 1.3 Entrants must ensure that they are available to attend all the events listed for the Competition. Check the Timeline for this year’s dates at the end of the page. 1.4 A non-refundable entry fee of AUD $100 applies. The Entry Fee is payable through PayPal or EFT (Electronic Funds Transfer). 1.5 An additional non-refundable fee of AUD $50 will apply for entries received after entries close but before the late-entry date of 18 April. 2.1 Please note: Entrants must verify that the items chosen to sing at the Finals Concert on 19 September 2019 are available in Australia. Entrants should contact the Music Library of Opera Australia or the Music Library of Symphony Services International. Pay particular attention to the correct orchestration and key. It is an essential requirement that entrants perform this check at the time of entry. If the item is unavailable, the full score (with orchestral parts) may be imported at the entrant’s expense. 2.2 Entrants should give careful consideration to selecting repertoire in which they are already proficient. This should showcase vocal quality, flexibility, style, range of expression and technique. 2.3 All items must be performed from memory and in the original language. There must be at least 3 languages in the repertoire. 2.4 Submitted repertoire can only be changed prior to the Heats, provided that it remains in accordance with the Rules and with the approval of the National Adjudicator. 2.6 Contestants will perform one item of their own choice and the Adjudication Panel may select additional item/s from the submitted repertoire. 2.7 Semi-Finalists will be required to prepare four items from the submitted repertoire, some or all of which may be heard by the Adjudicators. (ii) one from CATEGORY B. For the Public Concert, two of the four items will be performed, of which one must be from CATEGORY B. Timing: Together the items for the Public Concert should total a minimum of 6 minutes and not exceed 10 minutes. Entrants must check the timing to ensure that the maximum limit is adhered to. 2.8 Semi-Finalists will receive an Orchestral Repertoire Form from the Australian Singing Competition which must be completed and returned to the office by Friday 12 July. No change will be permitted. 2.9 Finalists must present 2 items from the submitted repertoire selected in consultation with the Adjudicators following the Semi-Finals. These items must be available to be sung with orchestral accompaniment. Timing: Together the items should total a minimum of 8 minutes and not exceed 12 minutes. Entrants must check the timing to ensure that the maximum limit is adhered to. 3.1 Contestants must engage their own accompanist for the Heats. 3.2 The official accompanist for the Semi-Finals is David Harper. Rehearsal times will be allocated for a one-hour rehearsal that is funded by the Competition. Additional rehearsal time may be made by arrangement with David Harper at the singer’s expense. 3.3 Finalists will perform with the Opera Australia Orchestra. Rehearsal time will be allocated. Dates and times to be confirmed. 3.4 Semi-Finalists and Finalists are obliged to attend all rehearsals as specified. 4.1 Adjudication will take place over three stages: Heats, Semi-Finals and Finals. The decision of the Adjudicators at all stages is final. 4.3 Any of the scheduled Heats may be cancelled if insufficient numbers register to be auditioned. It is recommended that all travel be booked only after your Heat time is confirmed. 4.4 At the Heats, contestants will sing 2 items from their repertoire. The first will be their choice, and the subsequent piece(s) will be selected by the Adjudicators. After singing, each contestant will be interviewed by the panel. 4.5 London Heats may be cancelled if insufficient numbers register to be auditioned. It is recommended that all travel be booked only after your Heat time is confirmed. Date and time to be confirmed. 4.6 Successful Entrants from the London Heats will need to make their way to Sydney for the Semi-Finals at their own expense and must ensure that they are able to attend all three days of activity and adjudication. 4.7 Contestants will sing 2 items from their repertoire. The first will be their choice, and the subsequent piece(s) will be selected by the Adjudicators. After singing, each contestant will be interviewed by the panel. 4.8 The Semi-Finals will take place in Sydney. A new panel of Adjudicators will join the National Adjudicator. (i) a private performance and interview in Sydney on Thursday 8 August. (ii) a public concert on Sunday 11 August. 4.10 The Finals Adjudication panel will include a non-voting Chair. 4.11 The National Adjudicator may be present at the General Rehearsal. 4.12 The Finals Concert will be staged in the Concert Hall of The Concourse at 7pm on Thursday 19 September. 5.1 Semi-Finalists will be invited to participate in a workshop on Friday 9 August. 5.2 The Workshop is not intended to form part of the adjudication process and is instead designed to provide and educational activity for the participants. 6.1 Finalists selected at the Semi-Finals will be invited to participate in a public MasterClass on Monday 12 August in the evening. 6.2 The MasterClass is not intended to form part of the adjudication process and is instead designed to provide an educational activity for the participants. 7.1 A copy of the music of all items to be performed at the Heats must be brought for the Adjudicators. 7.2 Semi-Finalists must provide David Harper, the official accompanist, with their scores by Monday 8 July. Scores must be scanned and sent via email (no photographed scores will be accepted). 7.3 A copy of the music of all items to be performed at the Semi-Finals must be brought for the Adjudicators. 8.1 By entering The IFAC Handa Australian Singing Competition (“the Competition”) you agree to comply with the terms and conditions attached to each Scholarship, Prize or Award. 8.2 The duration of any Scholarship will be for the period necessary for the successful recipient to complete the program of study undertaken. 8.3 All awards must be drawn within five (5) years of the recipient winning unless an alternative agreement is reached. Requests for funds must be made in writing, with a budget detailing the proposed use. 8.4 The Competition and Music & Opera Singers Trust Limited (“MOST®”) takes no responsibility for the acceptance of scholarships, which involve overseas travel. This decision is taken solely at the discretion of the recipient. Recipients are advised to check the current status of the country in question with the Australian Government’s Department of Foreign Affairs at the time of travel. 8.5 MOST® has the right to video, film, record or photograph and retain all stages of the Competition for archival or promotional purposes (“the Material”). MOST® has the right to retain the material on websites or any other analogue or electronic/digital media without fee to the singer and any personal information relating to the Competition. Broadcast, and narrowcast rights remain with MOST® and the Competition. 8.6 MOST® has the right to distribute, post the Material in any medium (including and without limitation on YouTube, Vimeo, Instagram, Twitter, Flickr, Facebook, Tumblr), in whole or in part for an unlimited period, without remuneration, for the purpose of promoting MOST® or the IFAC Handa Australian Singing Competition and associated entities. 8.7 The Competition and MOST® have permission to use the Material in any way that may otherwise infringe an entrant’s moral rights pursuant to the Copyright Act 1968 (Cth), including but not limited to, an entrant’s moral rights associated with their live performance in the 2019 IFAC Handa ASC when used for any promotion or publicity of MOST® or the Competition in any media without limitation for an unlimited period. 8.8 All approaches to the media must be made through and with the approval of MOST®. Contestants will be required to be available for media calls by arrangement. 9.1 Recipients are required to provide a report (not exceeding 1,200 words) to MOST® within 12 months regarding the benefit that the Scholarship, Prize or Award has had on their career. 9.2 All recipients of Prizes, Scholarships and Awards are encouraged to acknowledge the prize giver with a letter of thanks. MOST® and the IFAC Handa Australian Singing Competition reserve the right to make changes without notice.